Ready mixed, base coat plaster without lime, suitable for plastering and scratch coat, just by adding water. 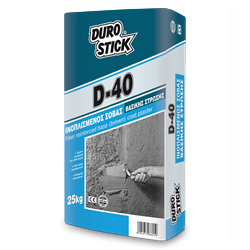 The product provides consistent quality and high durability (double when compared to traditional plasters). Apply it on wall surfaces made of brick, cement blocks and concrete. It creates a suitable substrate for the application of top coat plasters, such as D-41, the colored and water repellent plasters, Hydrostop DS-74 and DS-75, and the flexible plaster Hydrostop Plaster Elastic. Apply the plaster by using a gauging trowel and a hawk or with a plastering machine. Classified GP:CSIV/W1 per ΕΝ 998-1.